Ok, the first thing I learned while working on this post is that squash is not a photogenic food. In fact, the final product of both of these recipes isn’t the most appetizing thing you’re going to see on the internet today. Bare with me, I promise you they are much more delicious than they look! The second thing I learned is that you need to have a plan when photographing food. You can just chop all your ingredients and throw them in a pot and start shooting away (which is how I roll). Someday, I will learn… but today is not that day. So, even though the photos are amateur, I know that you’re going to enjoy these two squash centric recipes. We may not get fall weather in Jupiter but we do get fall produce! This is the easiest recipe under the sun. Utilize your Crock-Pot, leave for the day, and come home to a hearty fall meal. Put the chicken thighs in the Crock-Pot. 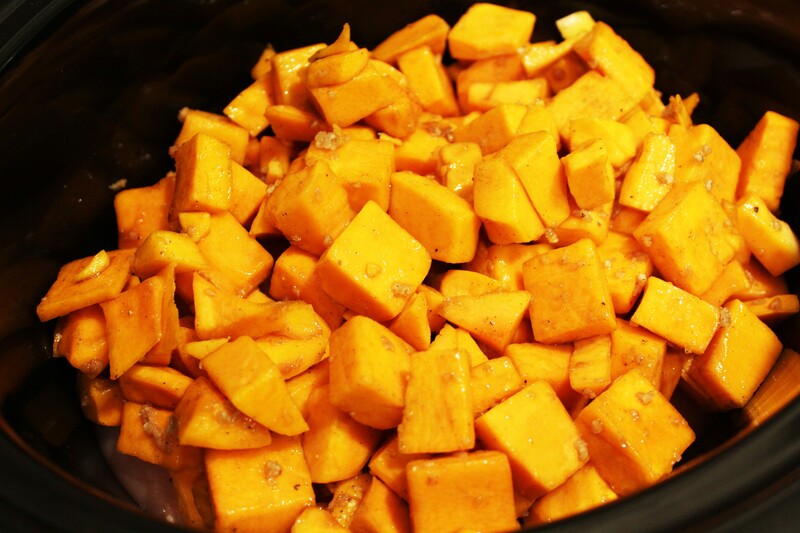 Mix together the squash, garlic, sage, balsamic vinegar, and salt and pepper. Pour the squash mixture over the chicken. Cook on low for four to six hours until the squash is soft. I promise, it tastes better than it looks. Just ask P.
This next recipe is from one of my most-used cookbooks, Practical Paleo, by Diane Sanfilippo. I don’t follow a paleo diet but this is one of my favorite ways to make a “pasta” dish without the wheat. Slice the spaghetti squash in half lengthwise. Just like when carving a pumpkin, scoop out the seeds and the inner portion of the squash. Place both halves face down on a baking sheet. Roast for 35 – 45 minutes or until the flesh becomes translucent and the skin begins to soften. You should be able to easily separate the “noodles” from the rest of the squash. Set the squash aside to cool enough so that you can handle it. Using a fork, create the “noodles” and scoop into a large serving bowl. While the squash is baking in the oven, prepare your bolognese sauce ingredients. P swears that this red onion was the most potent one he has ever chopped! We love our The Pampered Chef Cutting Edge Food Chopper and we recommend for chopping everything from carrots to nuts… just don’t use it on the bacon. In a large skillet (we prefer a large pot) over medium-high heat, melt the butter and saute the onions, carrots, and celery until they are translucent. Add the garlic and cook for an additional minute. Add the ground beef and bacon and cook until browned through. Once the meat is done, add the coconut milk, tomato paste, and white wine. Simmer over medium-low heat for 20 – 30 minutes or until the sauce is well combined and the alcohol is cooked out. Add salt and black pepper to taste before removing the sauce from the heat. Serve over roasted spaghetti squash. At first, the spaghetti squash noodles take a little getting used to but once they are smothered in the smoky bolognese sauce you won’t even miss the real thing! Adding more nutrients to your diet has never been easier! How will you cook squash this fall?